Lock in a great price for Soho Boutique Puerto - rated 8.4 by recent guests. It is a grand old traditional palace with comfortable rooms. The location for visiting Cadiz is superb, because the ferry leaves just opposite at the boat terminal. There is also a big parking area which has enough spaces at all times. We also recommend to visit El Puerto which is a very beautiful, historic town with lots to see. The location. This was very close to where we went on a tour of the Osborne Bodega and also very very close to the ferry port which we wanted to use to go to Cadiz. Excellent staff, clean, comfy, big rooms !!! Big bed, awesome breakfast. Lovely wide bed. Good patio. Large saloon bar. Very helpful polite staff. Very good location. Next to the catamaran point for Cadiz. Good range of hot and continental breakfast food, fresh crusty rolls and danish pastries, hot water for tea! Easy to find free parking and the location is good to experience the sherry Bodegas. The location and the staff WiFi working normally . Great location for sightseeing and activities for kids. Good parking. Full buffet or express breakfasts available, both delicious. 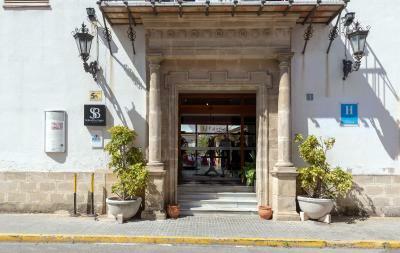 A lovely boutique hotel situated just 100 metres from the Cadiz Trimaran ferry. The beds were very comfortable and the breakfast was superb. There is a roof swimming pool, but we did not use it. A large public car park is available opposite the hotel if there is no free parking spaces on the road. Our room overlooked the river entrance and the sun rise was beautiful. Located very close to the port our delightful room with a gigantic comfortable bed was on the third floor. There was plenty of hot water and good towels with all necessary toiletries supplied. Reception staff were both delightful and helpful. 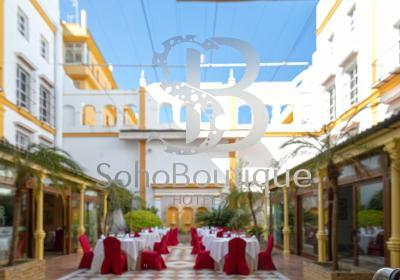 One of our top picks in El Puerto de Santa María.Located in the historic centre of El Puerto de Santa María, on the banks of Guadalete River, Soho Boutique Puerto features a rooftop pool with views over the city. It offers individually decorated rooms with air conditioning. All rooms have free Wi-Fi, a TV, and telephone. Each has a private bathroom with a bathtub. Meeting rooms and banquet facilities are available for a surcharge. The hotel includes a restaurant and a bar. Private parking is available on site for an extra cost. 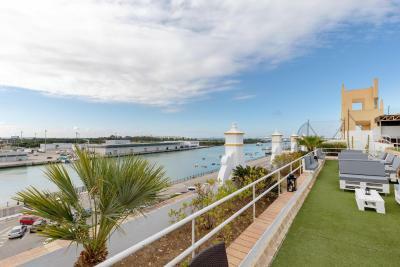 The port is a 5-minute walk away from the property and guests can enjoy boat trips to Cadiz. The beach is 900 yards away and Vista Hermosa Golf Club can be reached in 10 minutes by car. Jerez Airport is 16.8 miles from the property. Soho Boutique Puerto has been welcoming Booking.com guests since 30 May 2006. When would you like to stay at Soho Boutique Puerto? This air-conditioned room with free Wi-Fi has a TV, telephone, and private bathroom with a bathtub. House rules Soho Boutique Puerto takes special requests - add in the next step! Soho Boutique Puerto accepts these cards and reserves the right to temporarily hold an amount prior to arrival. We didn‘t like breakfast that much. Especially the coffee and orange juice were not to our taste. The only drawback was that the walls in the rooms are paper thin. We could hear everything from the rooms next to her including normal voice talking TV phones ringing etc. A little old fashioned. But quite acceptable especially for the price. So the view from the balcony was a car park for the ferry terminal but that was outweighed by the advantage of being a 2 minute walk to the ferry to Cadiz! The receptionist was very helpful and printed the plan for the trains to Cádiz for us as the ferry wasn’t going due to weather conditions. It’s just a minute to the port. We enjoyed our stay! Having stayed a few times, I recommend a superior room for better views and mini bar/fridge. Breakfast could have been organised a little better. I felt the one member of dining room staff paid little attention to the hot offerings that were very meagre in their quantity. With just three rashers of bacon and one over cooked fried egg on display one felt reluctant to indulge. However the one slice of bacon I had was delicious and I would have loved more. Very good and helpful Receptionist! The staff members were very friendly and helpful. I especially loved Anna! She was so nice to me! The bed was sooo comfy!!! I loved the balcony!!! It was very comfortable and I will come back and stay at The Soho boutique hotel again! Turning into the garage entrance is very difficult when a car is parked across the street. Not possible with a full length saloon car I think.